All eyes on much loved and fan favorite Dancing With The Stars pro Damian Whitewood. 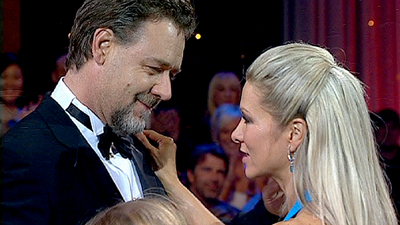 He and his partner Danielle Spencer have made the Grand Finals in the Australian version of Dancing With The Stars. Below is what their official site is reporting on their two dances, judges comments, and scoring. You can read the link for more on the night and how Danielle’s husband and Academy Award winning actor Russell Crowe (seen above with Danielle) made a surprise visit with the couple’s children Tennyson and Charlie at the end of the show. Danielle’s Tango was slightly amiss tonight although the judge’s admitted her dancing left little room for error. “We just expect perfection from you guys because you’re capable of delivering it,” Todd said, while Helen said the dance was “close to perfect”. In their second performances of the night, our celebrities raised the bar with knockout dances – Zoe taking out her second perfect score of 30 for the season, with Danielle one behind on 29. Here is some video coverage of Damian and Danielle’s two dances. Her kids are sooo adorable! There are some new dance moves that I have never seen before. 😯 Dame Edna makes an appearance to critique. She is a total crack up! So, here’s to next week’s Dancing With The Stars Grand Finals in Australia and pulling for Damian. Be sure to vote if you can. Wouldn’t it be something if he won like Peta did in the U.S.?